This one easily gets a solid watch it. While mildly unremarkable; it's got great characters, nice visuals, and high production quality. Easily worth the twelve episode run time if you want a nice high school character drama. My only real problem with this show is it's kinda confused as to what it wants to be. Looking at the title card, and the OP and a lot of aspects of this show, it seems to be a romance. The first few episodes play to this. However, as the show goes on, this romantic focus is kinda lost. From the beginning the show gives a lot of time to the two main characters' pasts: how these two middle schoolers drifted apart, how they came back together, and what those events mean moving forward. It's all really well done and one would think that these two working out their problems would bring them closer together. And it does, just not romantically. The last third of the show is dedicated to disecting dark and aloof Kou and with a secondary focus on Futaba's attempts to break through to him. There's nothing wrong with this, but the shift of focus and the emphasis on the role the group of friends play through out makes it feel weird. This show has no romantic resolution. Kou and Futaba are closer together but as friends not a couple, though the show does seem to tease a blur in this line. However, Futaba's closing monologue does a lot to kinda retcon the whole show from being a romance to a story to being about a group of friends helping out their really depressed friend. This is problematic however bc if looked at as a group of friends drama, the show is much weaker. All the focus was given to Futaba and Kou and the other three friends are rather poorly defined. That wasn't a problem when they were background for love but they aren't at the end of the show. I guess in the end, this show has a read the manga ending that really wound up changing how I looked at it as a whole. And it's not bad, just weird. But it does hold the show back from being truly amazing though. Aside from what many other reviewers have said, comparing this to other great anime romance series, I would like you to note the compressed short story style, using a broad brush on background conventions and zeroing in on the main story. I am about 1/2 way through the series. It seems the makers have a lot to say, and understand the limitations of fitting it all into only 12 episodes.I look forward to how this works out. Who doesn’t swoon at the idea of a rekindled lost love? Who doesn’t want that sweet angst? We could build a bridge out of the amount of high-school romance anime shows and reunite two long-distance lovers, and this one performs admirably in that mix. It carries all of the standard tropes centering a coming-of-age story about teenagers discovering who they are and coping with the tension between social expectations and internal truths. While the show’s themes are not revolutionary or complex, its underlying layers an nuances throughout the narrative elevate it from the standard. Futaba’s willingness to sacrifice her personality and image in order to survive her school experience is painfully authentic, endearing and relatable. Her relationship with Yuuri Makita, and the girls’ struggle between balancing their friendship and mutual feelings for Kou is handled sensitively. As is Kou’s rejection of his past self while navigating his trauma, guilt and grief. Perhaps the greatest quality of the show is to demonstrate the fluidity of the human spirit: we are capable of such change, such boundless opportunities. The capacity for growth, personal evolution and continual self-discovery. However, with this malleability comes anxiety: will those who loved us before love us now? 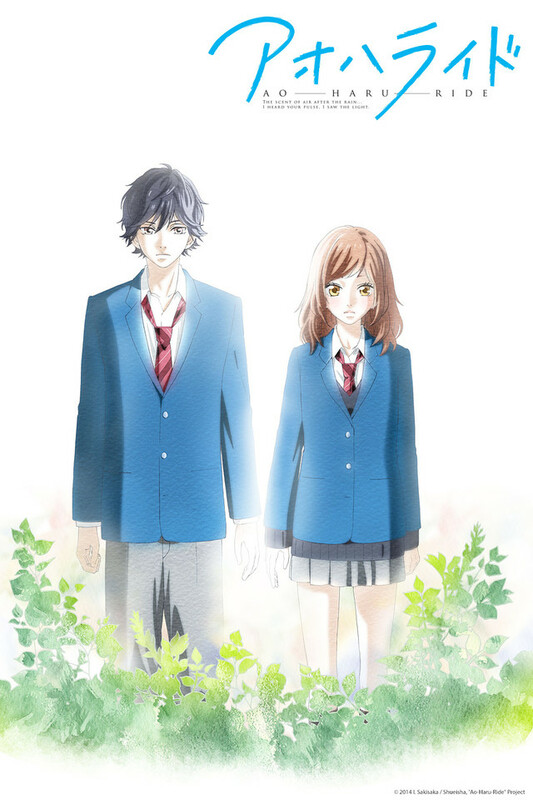 Blue Spring Ride‘s answer is maybe. In the case of Futaba and Kou, it’s a yes, but one that takes careful evaluation and self-reflection on and from both parties. Because of this, their relationship, when it finally does come to fruition, is tenderly realistic and true to their characters. If what you lost was too big and you can’t replace it with something else, you don’t have to replace it with just one thing, right? If you get ten small things or a hundred small things, all together it will be enough of a reason for you to keep going! When you said that we were scary, that means deep down, you had started to care about us! The thought of losing someone again… That’s the scary part, right? No one’s going to criticize you if you get excited for something, or you laugh with all your heart! And if someone does, I’ll beat them up! But I think it’s natural that not everything you try will go well, right? So, I’m gonna start again from scratch. Oftentimes, I did find this show predictable and admittedly there were several times where I just thought: really?… For some, the plot may be too vanilla, too lack-luster and boring. The side characters fell a little flat. Even Yuuri’s interest in Kou (while relatable) was executed on superficial terms. The love triangle was used as more of a plot device to develop Futaba’s character, really. Additionally, there are some instances where Kou’s actions and words borderline on abuse, and where his character slips into a cliche which propagates female guilt and helplessness. The scene where he pins Futaba down to explain she must be conscious of possible assault is one of those times. It’s a scene which appears frequently in anime and media, but that doesn’t make it very accurate or helpful as a social commentary. That’s a personal thing for me, but not something I knock off many points for. Compared to others who follow this trope and plot, it surpasses and surprises with its refreshing character development of its main duo. Ultimately, I enjoyed this anime. It’s like a white t-shirt: fitting and comfortable without being excessive or revolutionary. It’s a better version of Wolf Girl, black Prince and gives off Orange feels (perhaps because the lead couple look so similar??). Surprise it's more that amazing!! I was surprised because of the anime I was looking just for something to watch, and I thought this was another shojo common anime, but it ended up making me want more, this is a really good anime the story, the characters, everything around the main characters it's just too good !!! please watch this it's just more than amazing!! I thought this would be your typical run-of-the-mill shojo anime, but this really had a good lesson behind it. It shows the fact that you're truly never alone and I love how the main protagonists developed throughout the show. I also love the message that no matter how big the size of the hole in your heart is, you can always fill it back up with people and the things you love. This series unfortunately is very typical for modern anime--especially of the shoujo variety. The series is very cute (if even forgivably corny in places, but still enjoyable overall), but the series is more used as an advertisement for the anime. The last episode (Page 13 / OVA 2) is not here on Crunchyroll, but you can view it elsewhere. It has a more conclusive ending than episode / page 12, but it's still a cliffhanger encouraging you to read the manga instead. I think I might be shocked if there was ever a series like this that finished the entire story. But, if you don't mind reading the manga after this, then it's definitely a cute anime to watch either in-between shows or to kill some time. One of the absolute best anime I have ever seen. It is a romance series but the romance isn't at the center. It's used to develop and grow the characters. So don't expect the classic tropes of repeated misunderstandings until they get together and kiss at the end. Expect a group of people growing together with some romance and a bunch of feels, so many feels. I am pretty picky when it comes to romance animes. This one stand outs to me because the main characters is so likeable, she is not incompetent like most female leads! She is daring and respectable. The plot buildup is good, but fair warning there is no season 2, which is pretty much set up for so you may be disappointed. But I think the first 13 episodes are worth it. It made me read the manga and i NEVER read manga.